SKIMS Medical College Srinagar Kashmir SKIMSMC Recruitment 2018: SKIMSMC recently published the official jobs notification for the posts of Professor, Assistant Professor, Associate Professor, Tutor jobs. SKIMSMC Srinagar going to recruit 15 vacancies. All the interested candidates can apply for the various vacant positions in the SKIMSMC. The SKIMSMC Srinagar published vacancies for Hiring Unemployed candidates of J&K. Interested Candidates must possess at least Graduate or Bachelor degree or any higher/ equivalent qualification pass from an institute recognized by the State Government to apply for the same post. 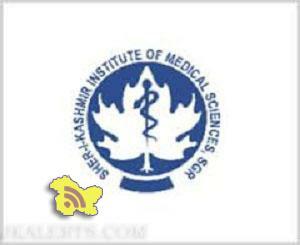 SKIMSMC Medical College Srinagar Kashmir Jobs Details. All the interested and Eligible candidates can apply application through offline mode in the office of the Administrative Officer SKIMS Medical College Bemina by or before 20-08-2018 up to 3.30 PM. Jkalerts will provide you the complete detail about this J&K Govt job notification like Eligibility criteria, How to apply Online, Important dates, Age limit with relaxation, post by category, Selection process & official notification. So interested candidates are requested to read it carefully to apply SKIMS Bemina jobs. Professor 01 / Rs 60,000/- MD, Psychiatry from recognised University/ Institution. As Associate Professor in the subject for 04 years in a permitted/ approved/ recognized Medical Colleqe/ Institution (04) Research publications in indexed journal on cumulative basis with minimum of (02) Research publications during the tenure of Associate Professor as V Author or as corresponding Author. Associate Professor 01 / Rs 50,000/- MO, Psychiatry from recognised University/ Institution. As Assistant Professor in the subject for (04) years in a permitted/approved/ recognized Medical College/ Institution (04) Research publications in indexed journal on cumulative basis with minimum of (02) Research publications during the tenure of Assistant Professor as V’ Author or as corresponding Author. Assistant Professor01/ Rs 40,000/- MD, Psychiatry from recognised University/ Institution. (03) years teaching experience after acquiring postgraduate qualification as Lecturer/ Senior Resident/futor Demonstrator from a recog­nized Medical College/Teaching Institution. Associate Professor In Clinical Psychology 01 / Rs 25,000/- M. Phil + Ph. D in Clinical Psychology from recognised University/ Institution 05 years teaching experience either as Assistant Professor/ Lecturer in recognised Medical College Three Research publications in indexed journal as first/second/ corresponding author. Clinical Psychologist 04 / Rs 20,000/- Ph. D/M.Phil. Clinical psychology from a recognized university/ UGC recoqnised institution. Associate Professor in Psychiatric Social Work 01 / Rs 25,000/- M. Phil + Ph. D in Psychiatry Social Work from Govt. / UGC recognised Institution. 05 years teaching experience either as Lecturer or as Assistant Professor from and Govt./UGC recognised Institution. Three Research publications in indexed journal as first/second/ corresponding author. Psychiatric Social Worker 01 / Rs 20,000/- Ph. D/M.Phil. Psychiatric Social Work from a recognized university/ UGC recognised institution. Tutor in Psychiatric Nursing 01 / Rs 16,000/- B.Sc. Nursing from a recognized university. The applicants shall have to appear before the selection committee constituted for the purpose along with all the original testimonials and ur at jkalerts other related documents on the date of interview, which will be notified separately through print media as well as official website of SKIMS Medical College & Hospital, Bernina, Srinagar viz. skimsmc.edu.in. No separate call letters will be sent to the candidates for appearing in the interview. An active contact number/E-mail address must be mentioned on the application form. The applications should reach in the office of the Administrative Officer SKIMS Medical College Bernina by or before 20-08-2018 up to 3.30 PM.